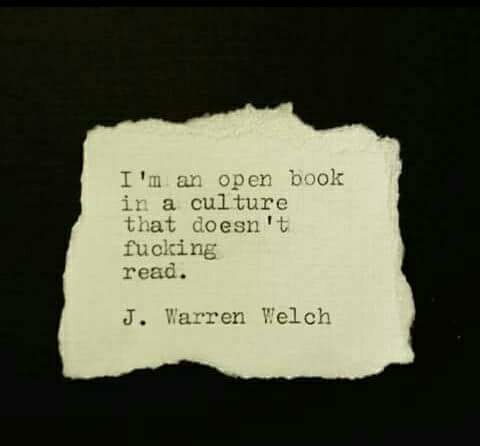 I saw a meme on Facebook that said something like, “I’m an open book in a world full of people that don’t read.” This speaks loudly to me as I can relate so well. I’m so much different from most of those around me. I’m a deep feeler surrounded by those that are numb. I’m a master communicator surrounded by those that just remain silent when I so badly just need to hear their words. So what do I do? I hold so much inside. I hold it inside until it feels like it’s all going to make me crazy. I hold it in while it eats my soul. I quietly cry tears of loneliness and frustration in the dark. I privately meltdown feeling I’m just too much for others. Then, I do the only thing I know how to do to cope, and I write. I don’t have much choice in anything though, other than choosing to try to be positive, choosing to keep my hope and faith intact, choosing not to allow the world to make me bitter, and choosing to continue writing. The rest of life is left up to powers bigger than mine. One thing is certain, I’m just always going to be that open book, and maybe someday, that open book can become a real written book and will make an impact on others for the better. This is my biggest life goal. I am selfish. Well, I mean, not all of the time, but in the ways that I am selfish, it’s more of an issue than I would care to admit to. I’ve been thinking about this for quite a while now. You see, at work, I spend a ton of time trudging all over what I affectionately call “the back 40.” Most of my time at work is spent out on the massive property alone, and of course, while alone, this allows for so much thinking time that sometimes I think I’ll make myself crazy. Lately, while doing all of this thinking, I’ve thought a lot about something my sister said when we argued. She had said that I was unable to see a situation beyond my own feelings. In the moment, I totally disregarded it because I’m about as empathetic as they come. Here’s the deal though, once I’m in an emotional state about a situation or a person, she’s totally right. This was solidified by me when remembering an argument with my longest known friend a while back because she said pretty much the same thing too. I so very much see the situation from how ~I~ feel, and not the other person. The worst part of all of this is that I get so caught up in my feelings that I then get upset. I take it as a personal insult. My emotions get carried away and run off with dramatic flair that can only be rivaled by things like a teenage girl finding out the boy she likes has been passing notes with the popular girl in Spanish class. You get the idea. My feelings sometimes make me a little dramatic. Here’s my big realization though; no one owes me anything. So much of what I set myself up for with being upset is thinking that others owe me something just because of how I feel about them. They don’t though. This realization hit me like a ton bricks this morning when I woke up. It’s been a recent lesson in my life with more than one person, especially my family. The good thing about realizing it though is that I can change myself. By knowing that there’s nothing owed to me from anyone, I am not setting myself up for letdowns by expectations. I also know that when I do get into those emotional situations, instead of being selfish about what I feel I deserve, I need to take a step back and check myself. I need to remember that others don’t have my exact same heart and feelings, and just because I don’t get the response I feel I deserve does not mean that the other person doesn’t care. Sometimes the first step to happiness and change is recognizing one’s own faults. The key to a happy life is inside of myself. I absolutely cannot change others, but I can change my own reaction to others. There is power in this realization. Like anyone else, I am constantly learning, constantly growing, and constantly striving to become a better woman than I was the day before. I can choose not to be selfish. I can choose to be more empathetic even when I feel intensely. And mostly, I can choose to recognize my own BS.